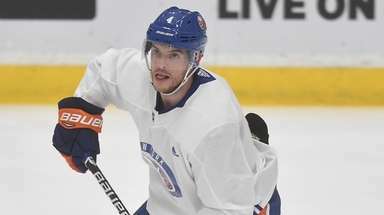 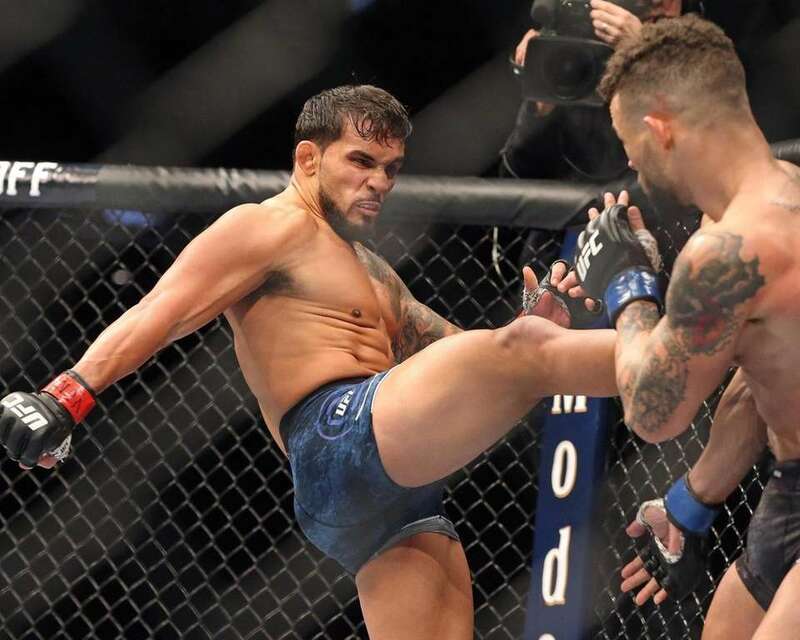 Scenes from UFC Fight Night Brooklyn on Saturday, Jan, 19, 2019, at Barclays Center. 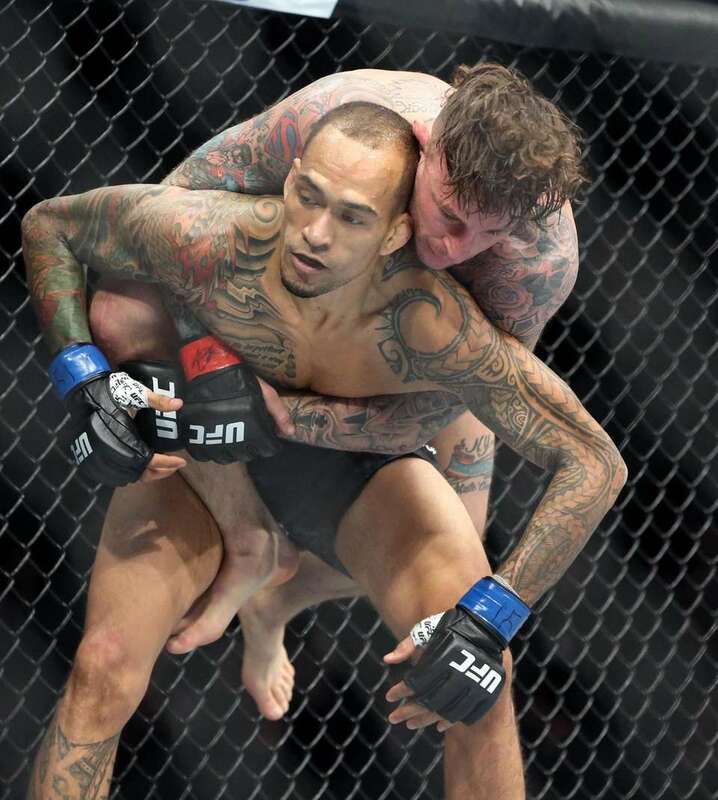 Allen Crowder, left, grapples with Greg Hardy during the first round of a heavyweight mixed martial arts bout at UFC Fight Night early Sunday, Jan. 20, 2019, at Barclays Center. 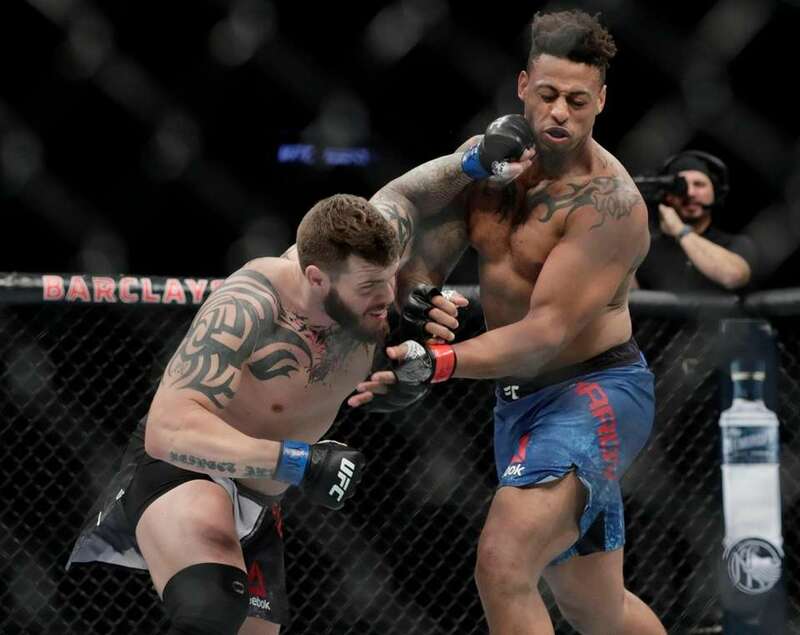 Greg Hardy, right, punches Allen Crowder during the second round of a heavyweight mixed martial arts bout at UFC Fight Night early Sunday, Jan. 20, 2019, at Barclays Center. 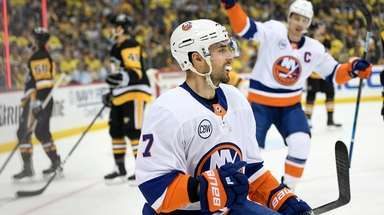 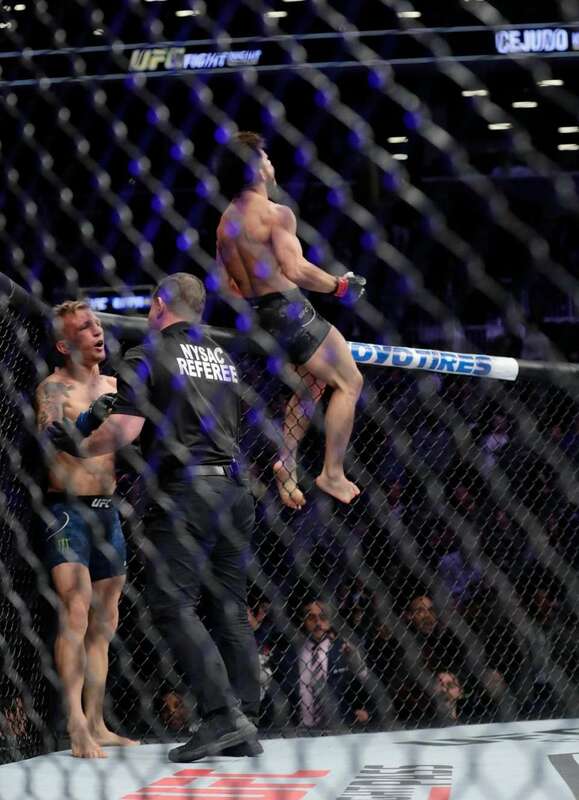 Henry Cejudo, right, celebrates after stopping TJ Dillashaw during the first round of a flyweight mixed martial arts championship bout at UFC Fight Night early Sunday, Jan. 20, 2019, at Barclays Center. 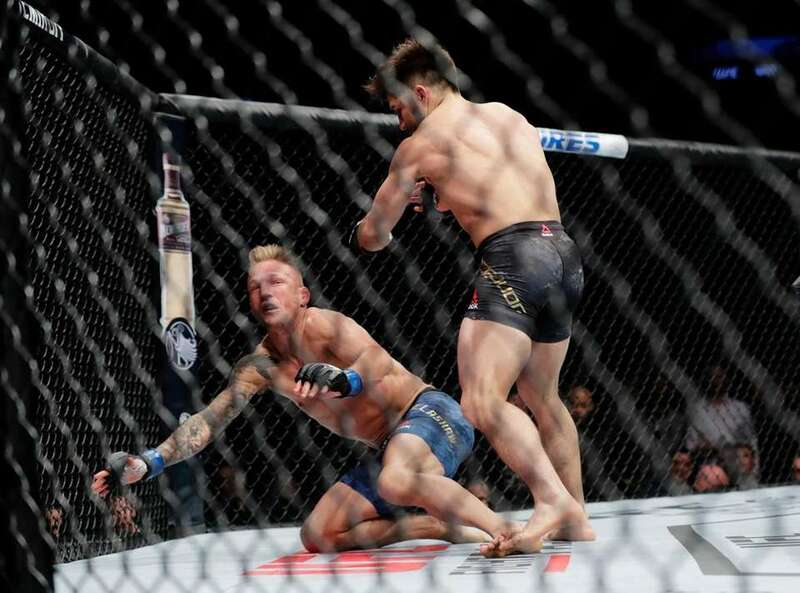 Henry Cejudo, right, knocks down TJ Dillashaw during the first round of a flyweight mixed martial arts championship bout at UFC Fight Night early Sunday, Jan. 20, 2019, at Barclays Center. 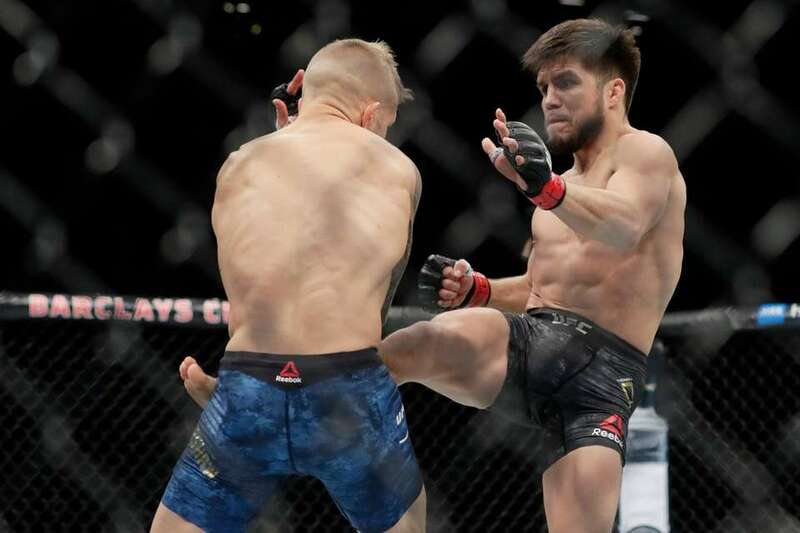 Henry Cejudo, right, kicks TJ Dillashaw during the first round of a flyweight mixed martial arts championship bout at UFC Fight Night early Sunday, Jan. 20, 2019, at Barclays Center. 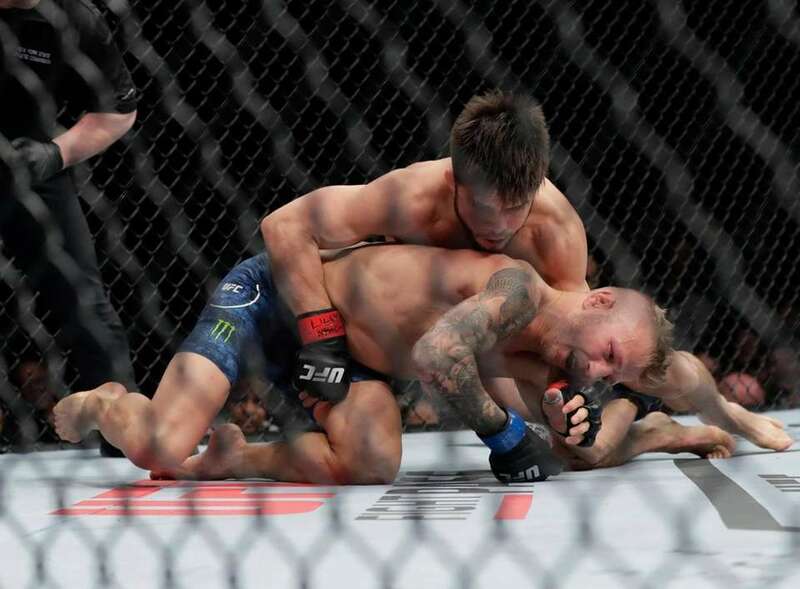 Henry Cejudo, above, wrestles with TJ Dillashaw during the first round of a flyweight mixed martial arts championship bout at UFC Fight Night early Sunday, Jan. 20, 2019, at Barclays Center. 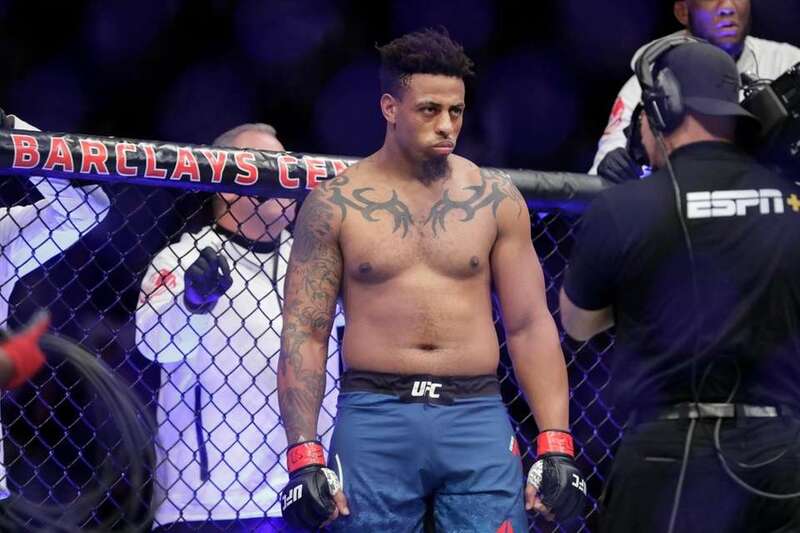 Greg Hardy waits for his heavyweight mixed martial arts bout against Allen Crowder at UFC Fight Night early Sunday, Jan. 20, 2019, at Barclays Center. 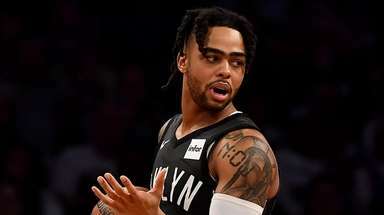 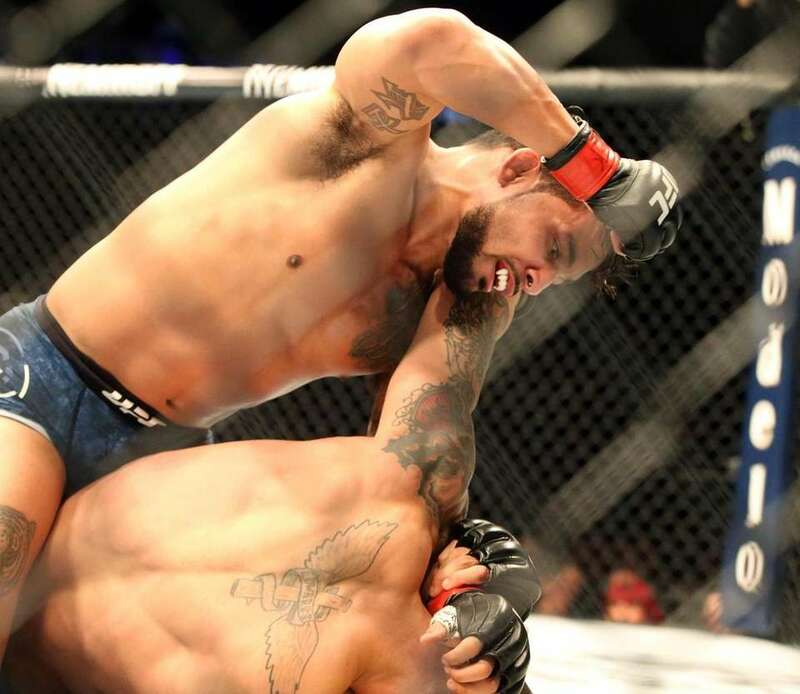 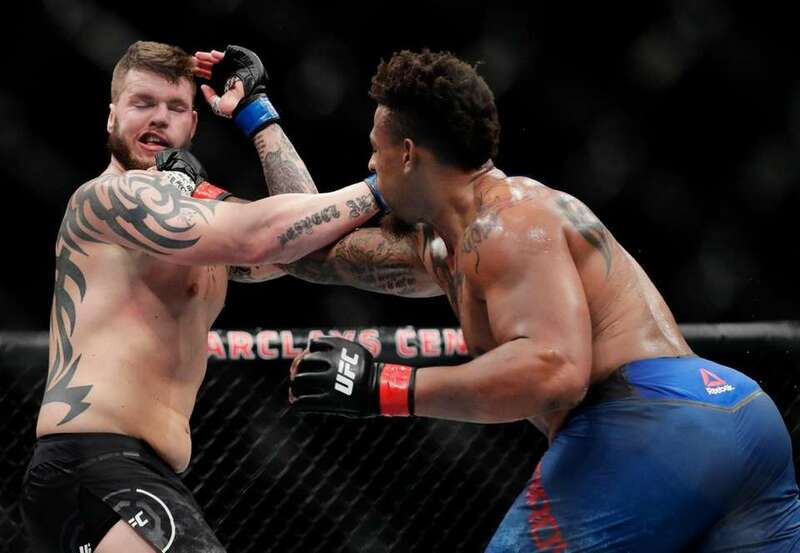 Allen Crowder, left, punches Greg Hardy during the first round of a heavyweight mixed martial arts bout at UFC Fight Night early Sunday, Jan. 20, 2019, at Barclays Center. 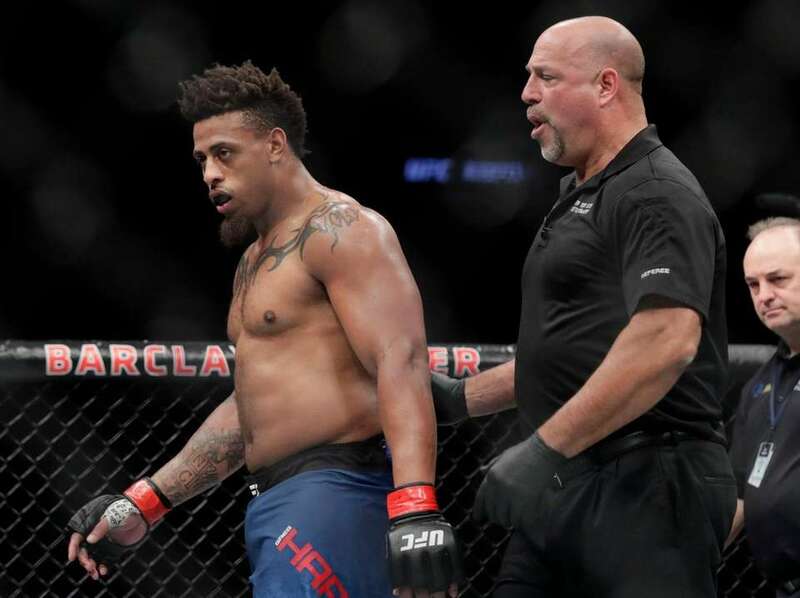 Greg Hardy is escorted by the referee after being disqualified during the second round of a heavyweight mixed martial arts bout against Allen Crowder at UFC Fight Night, early Sunday, Jan. 20, 2019, at Barclays Center. 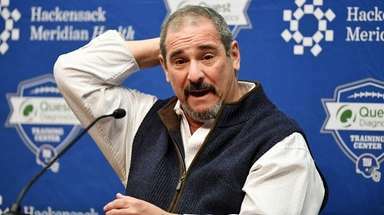 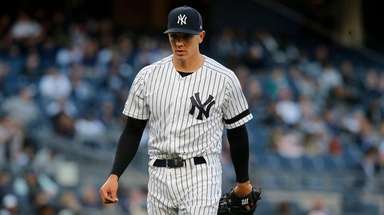 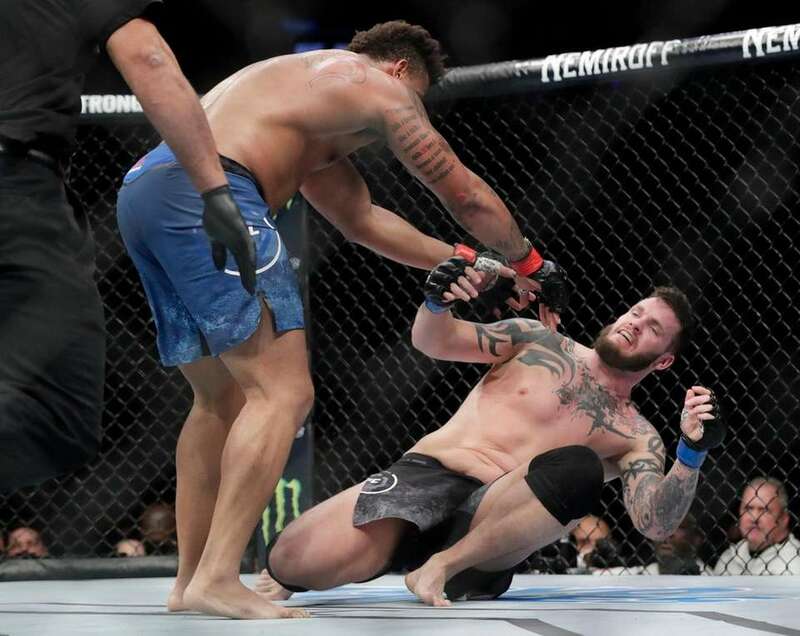 Crowder won after Hardy was disqualified for an illegal knee. 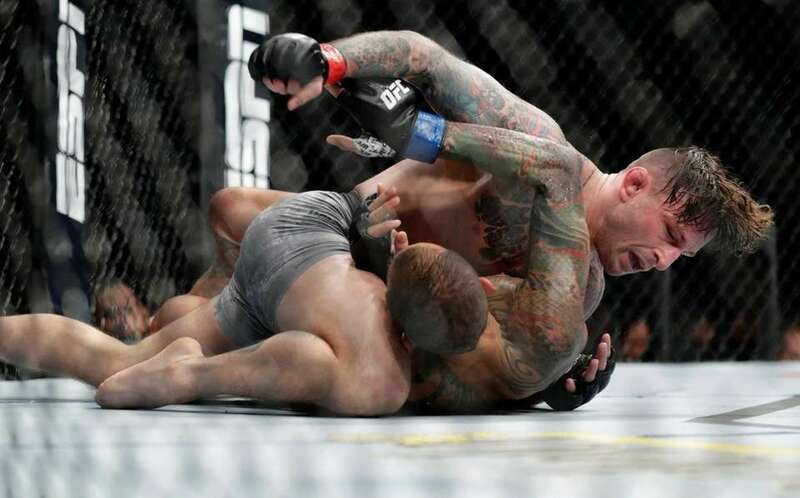 Allen Crowder, right, falls down after Greg Hardy delivered a knee to his head during the second round of a heavyweight mixed martial arts bout at UFC Fight Night, early Sunday, Jan. 20, 2019, at Barclays Center. 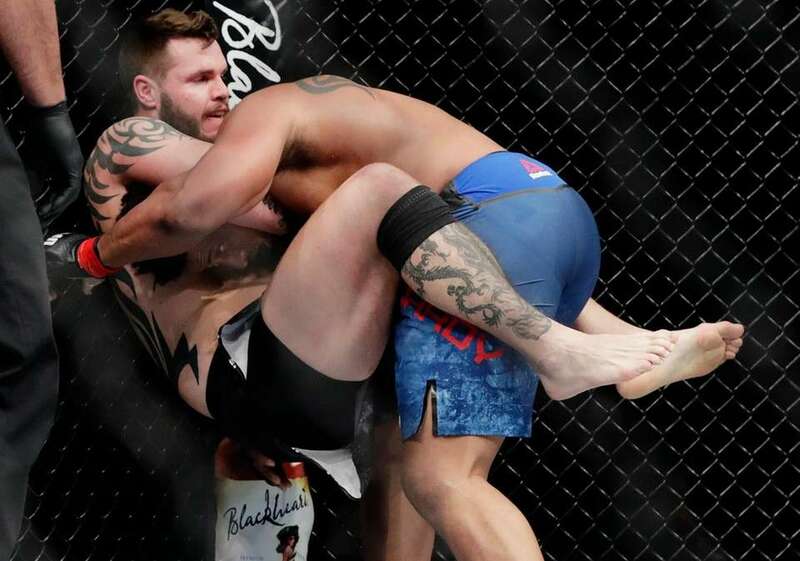 Crowder won the fight after Hardy was disqualified for an illegal knee. 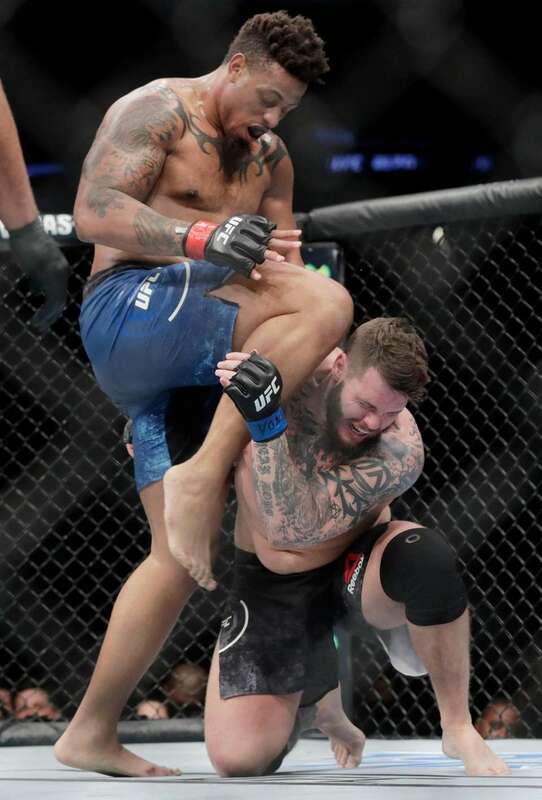 Greg Hardy knees Allen Crowder on the head during the second round of a heavyweight mixed martial arts bout at UFC Fight Night, early Sunday, Jan. 20, 2019, at Barclays Center. 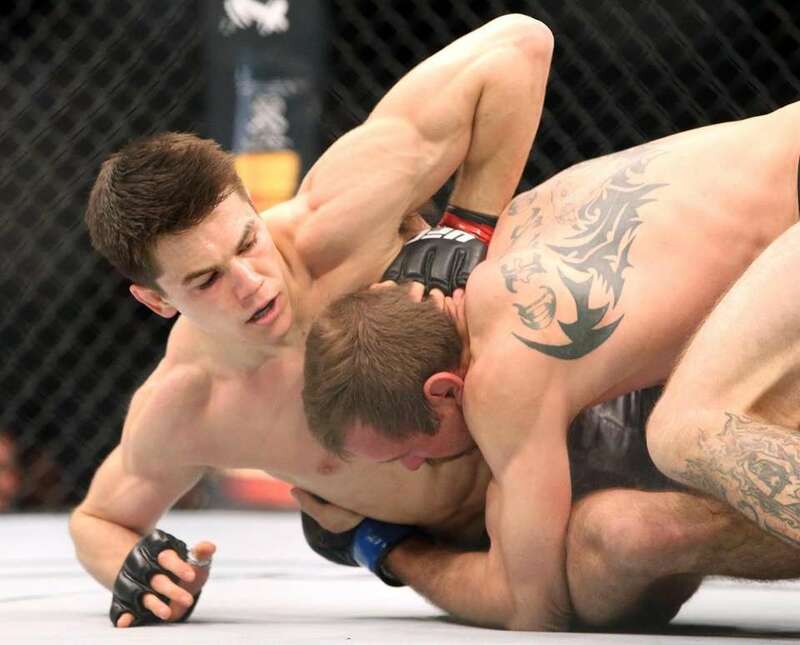 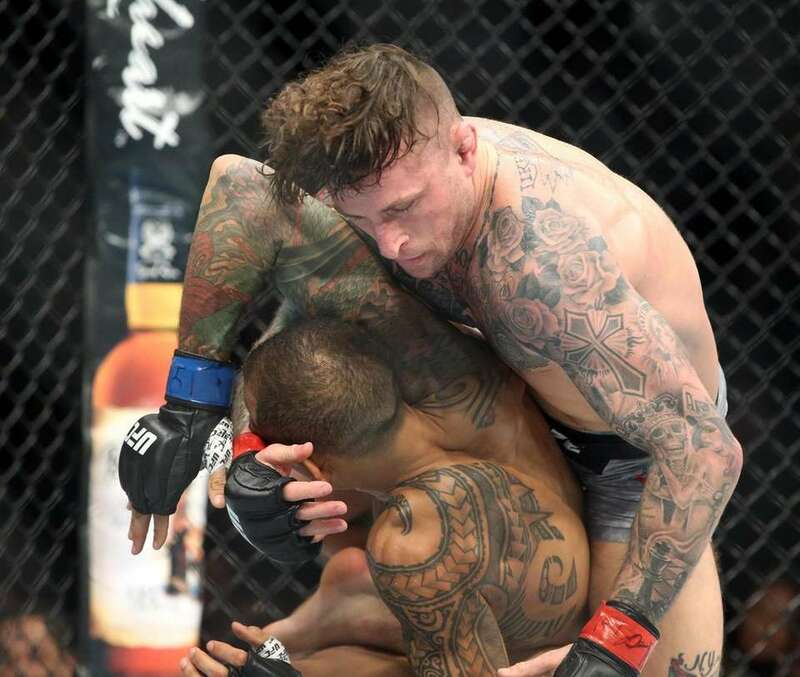 Crowder won the fight after Hardy was disqualified for an illegal knee in the second round. 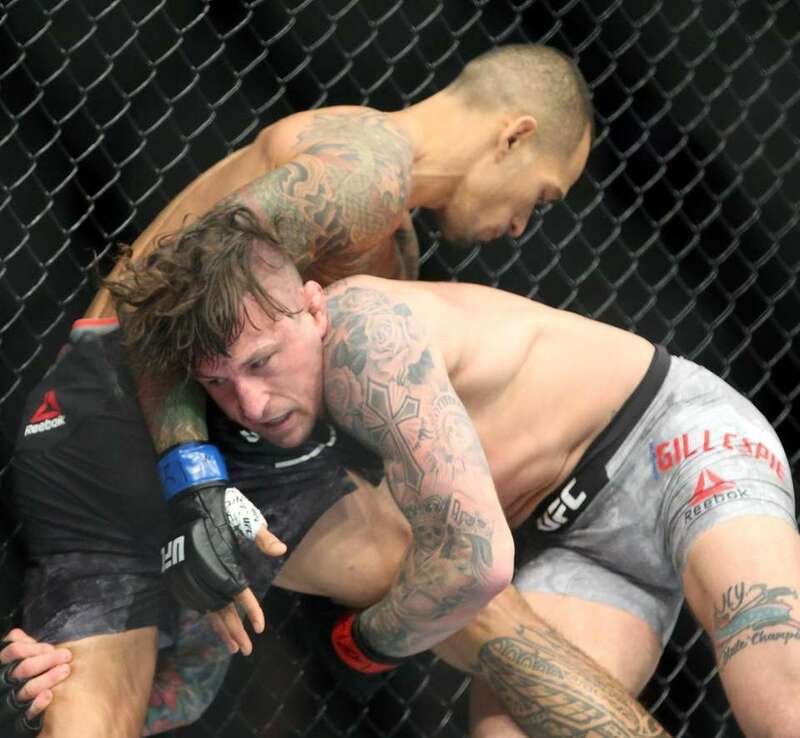 Gregor Gillespie fights Yancy Medeiros during UFC Brooklyn at Barclays Center on Saturday, Jan. 19, 2019. 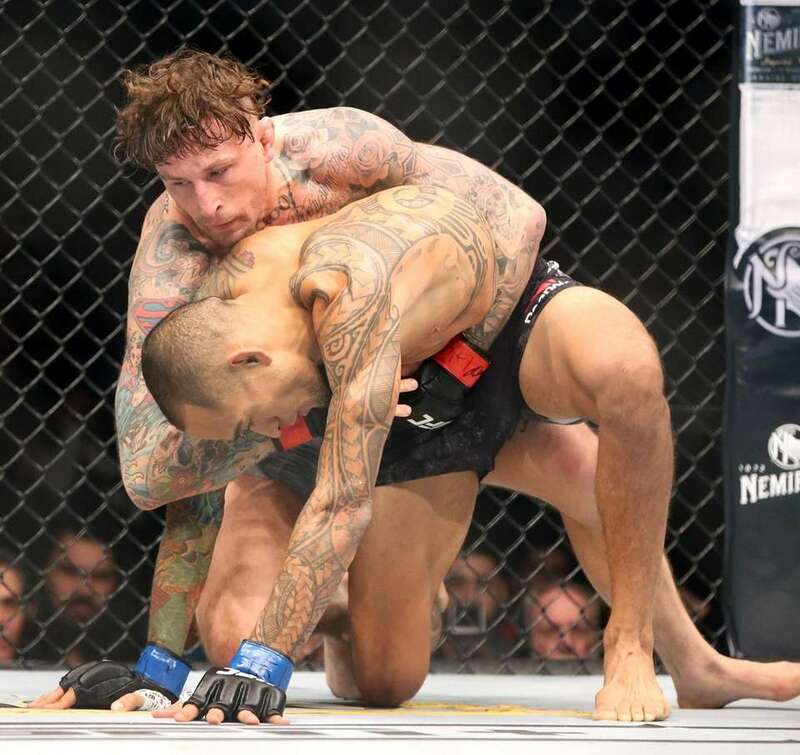 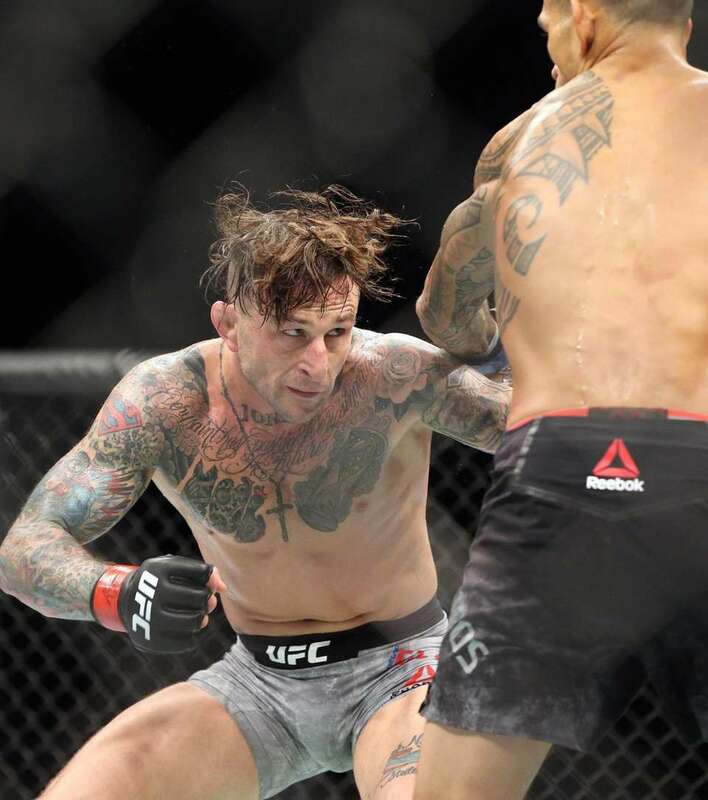 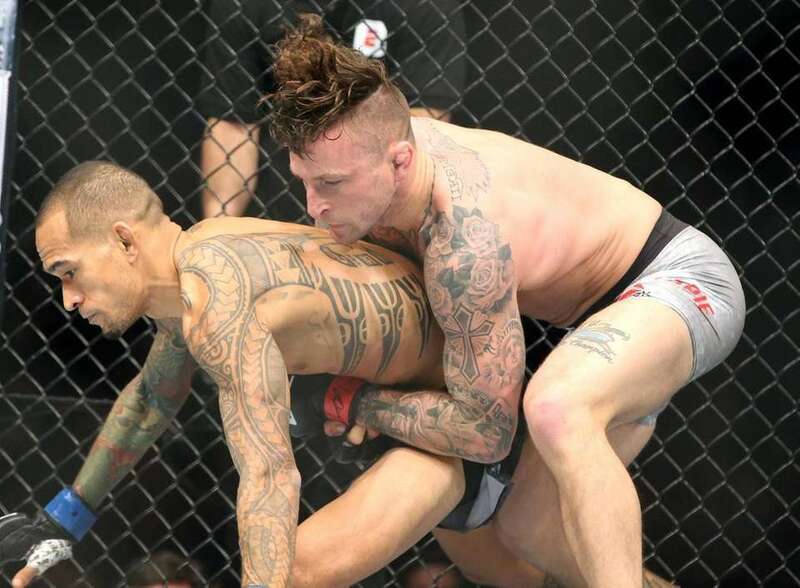 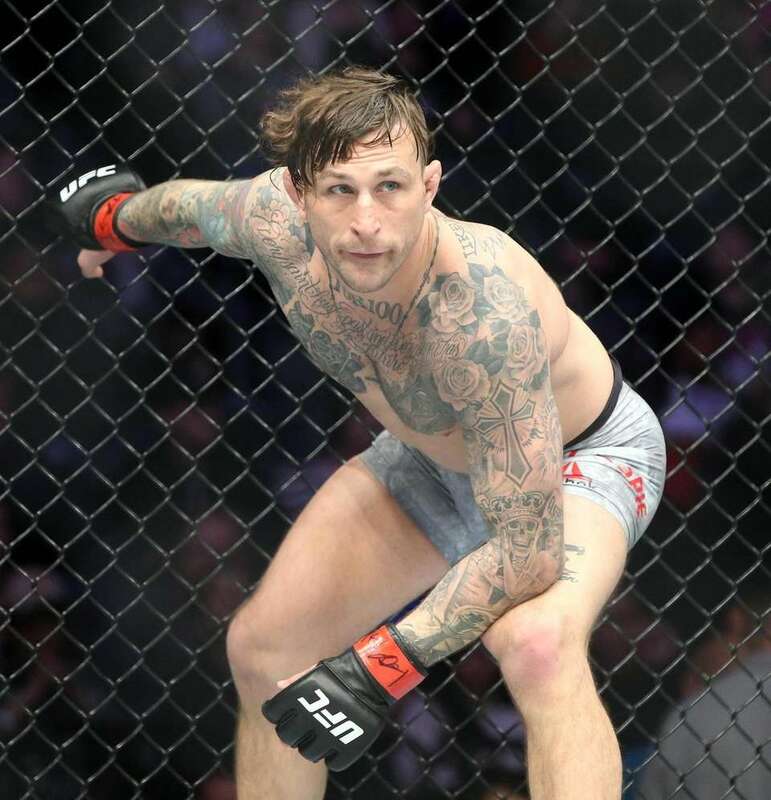 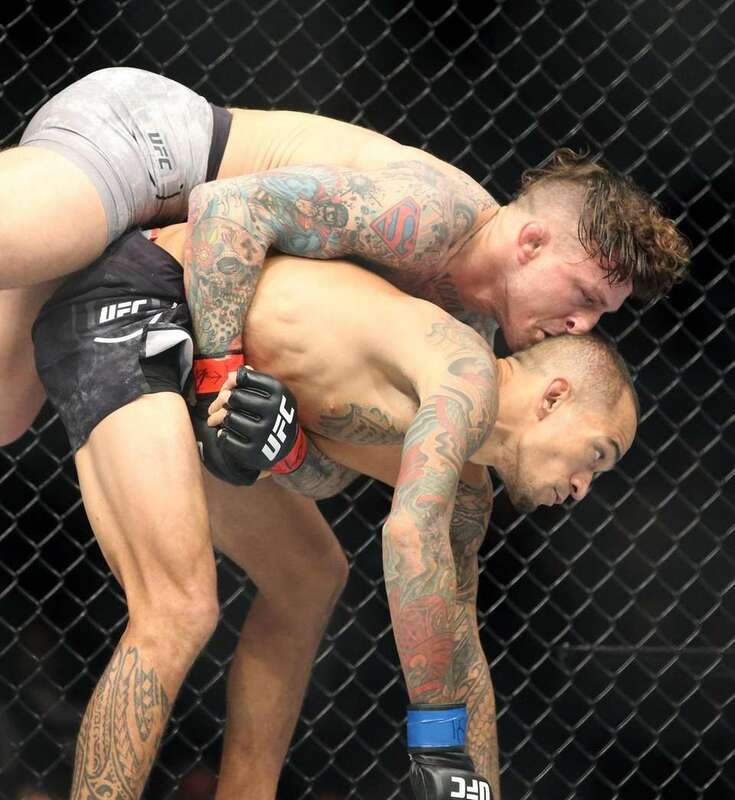 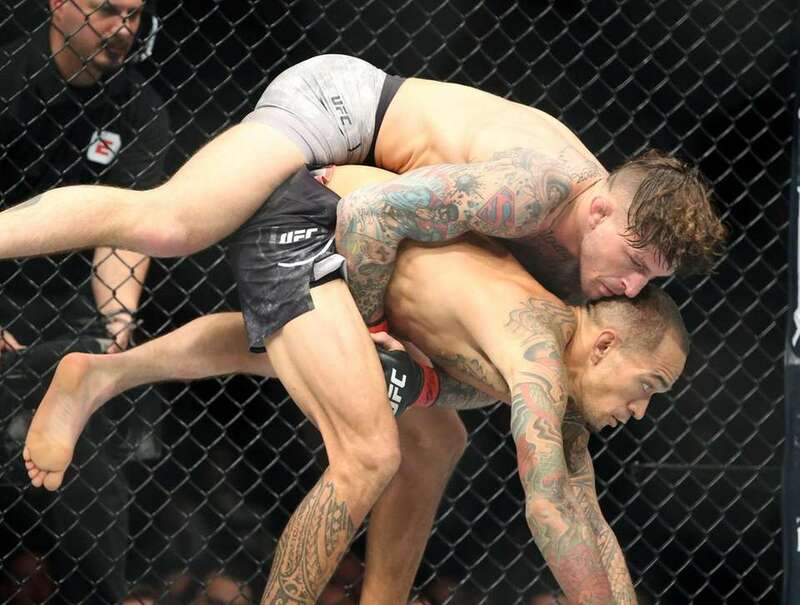 At 155 lbs Gregor Gillespie defeated Yancy Medeiros during the UFC Brooklyn fights at Barclays Center in Brooklyn, New York on Jan. 19, 2019. 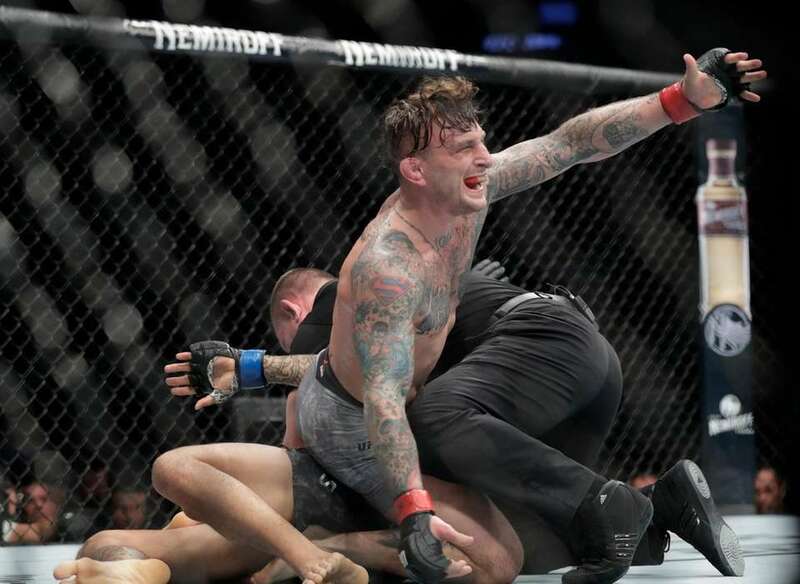 Gregor Gillespie reacts after stopping Yancy Medeiros during the second round of a lightweight mixed martial arts bout at UFC Fight Night on Saturday, Jan. 19, 2019, at Barclays Center. 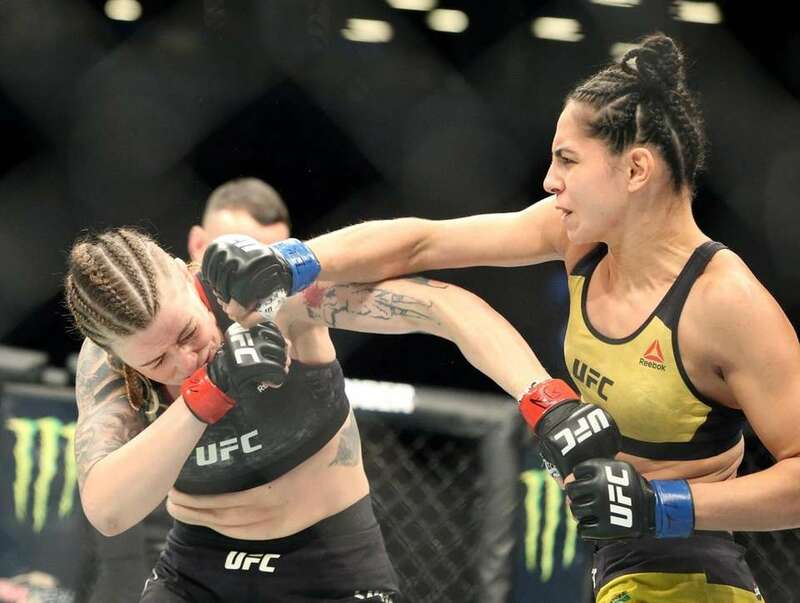 Rachael Ostovich, left, grapples with Paige Vanzant during the first round of a women's flyweight mixed martial arts bout at UFC Fight Night on Saturday, Jan. 19, 2019, at Barclays Center. 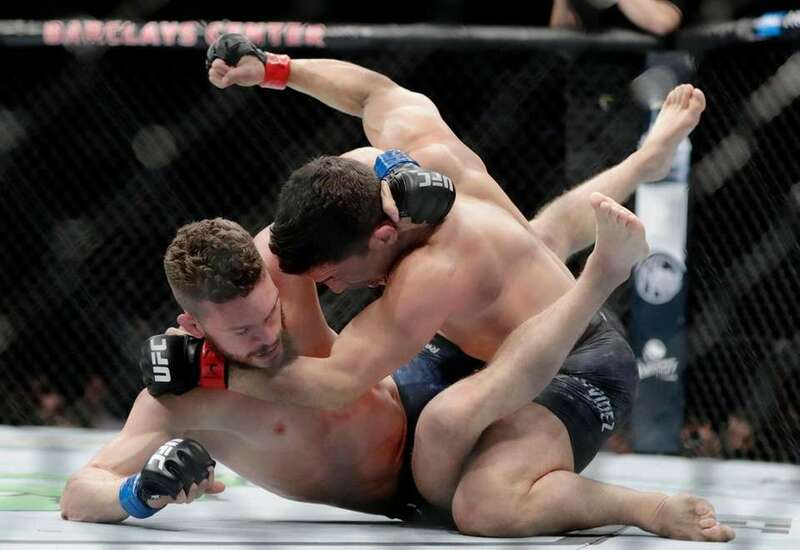 Joseph Benavidez, right, punches Dustin Ortiz during the second round of a flyweight mixed martial arts bout at UFC Fight Night on Saturday, Jan. 19, 2019, at Barclays Center. 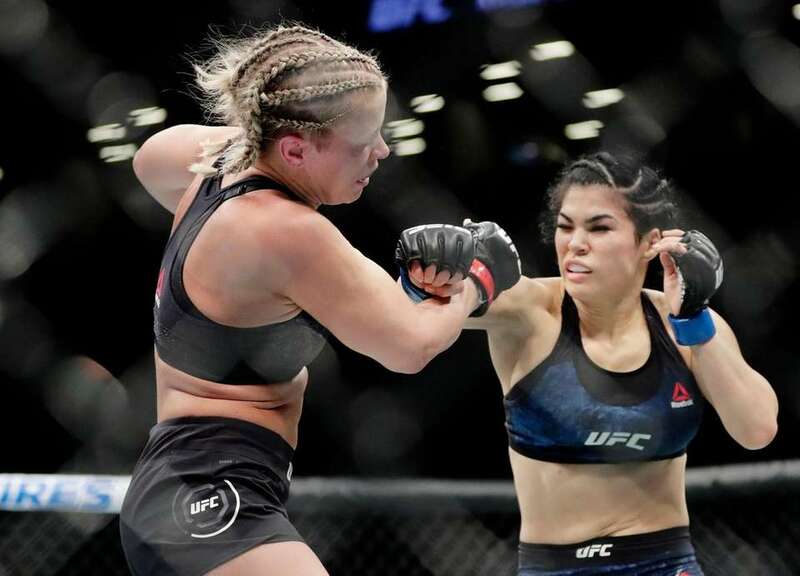 Paige Vanzant, right, punches Rachael Ostovich during the second round of a women's flyweight mixed martial arts bout at UFC Fight Night on Saturday, Jan. 19, 2019, at Barclays Center. 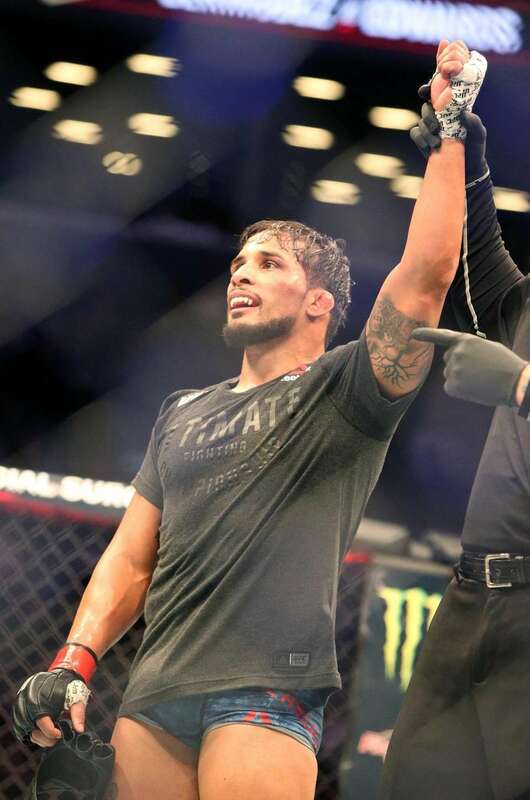 Joseph Benavidez, left, celebrates after winning a flyweight mixed martial arts bout against Dustin Ortiz at UFC Fight Night on Saturday, Jan. 19, 2019, at Barclays Center. 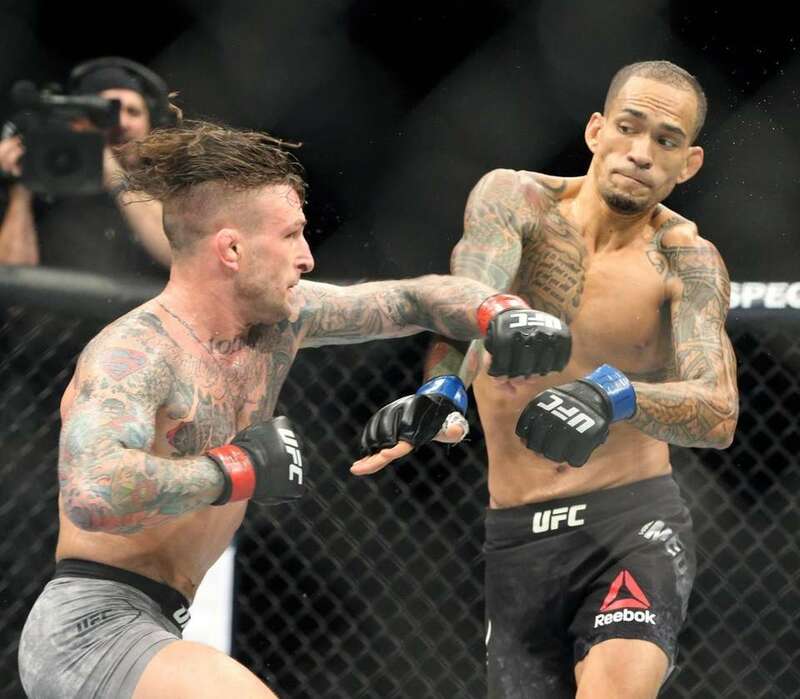 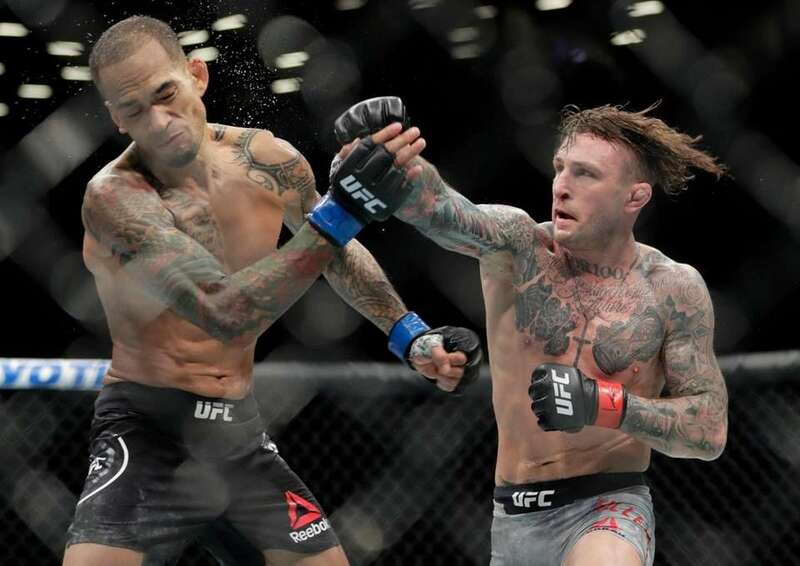 Gregor Gillespie, right, punches Yancy Medeiros during the second round of a lightweight mixed martial arts bout at UFC Fight Night on Saturday, Jan. 19, 2019, at Barclays Center. 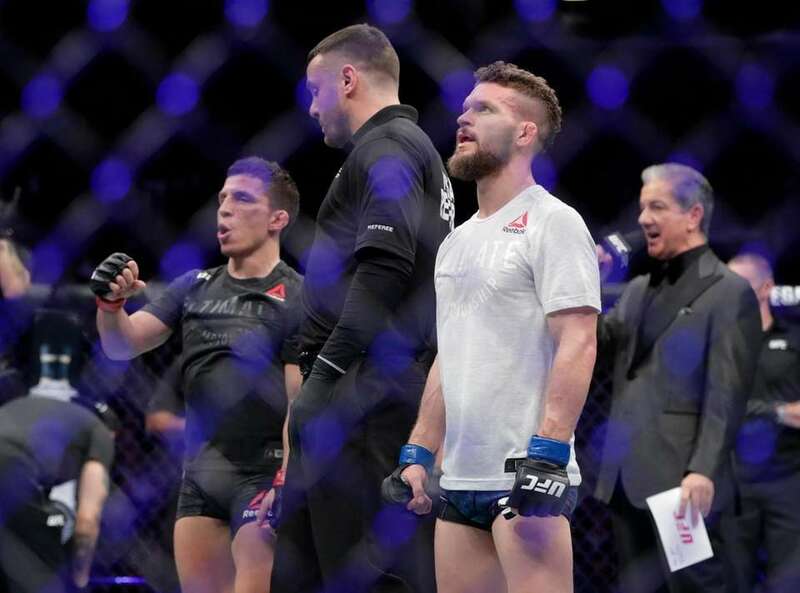 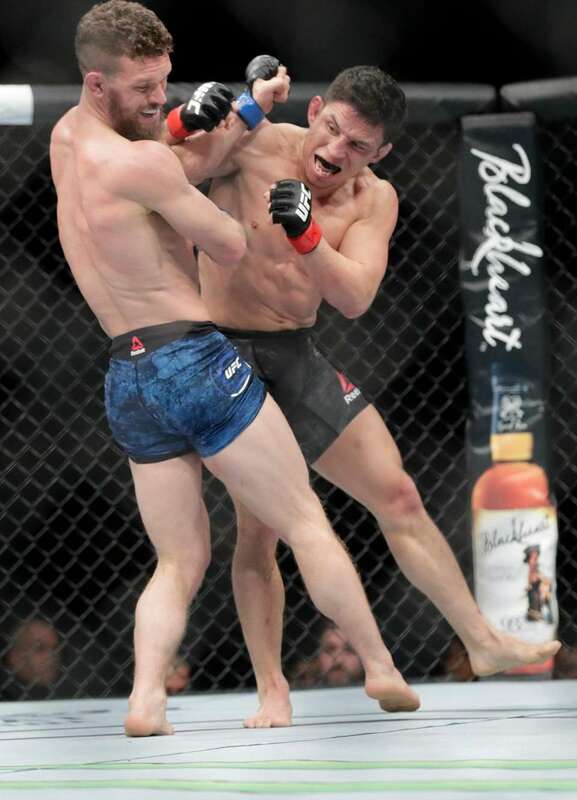 Joseph Benavidez, right, punches Dustin Ortiz during the first round of a flyweight mixed martial arts bout at UFC Fight Night on Saturday, Jan. 19, 2019, at Barclays Center. 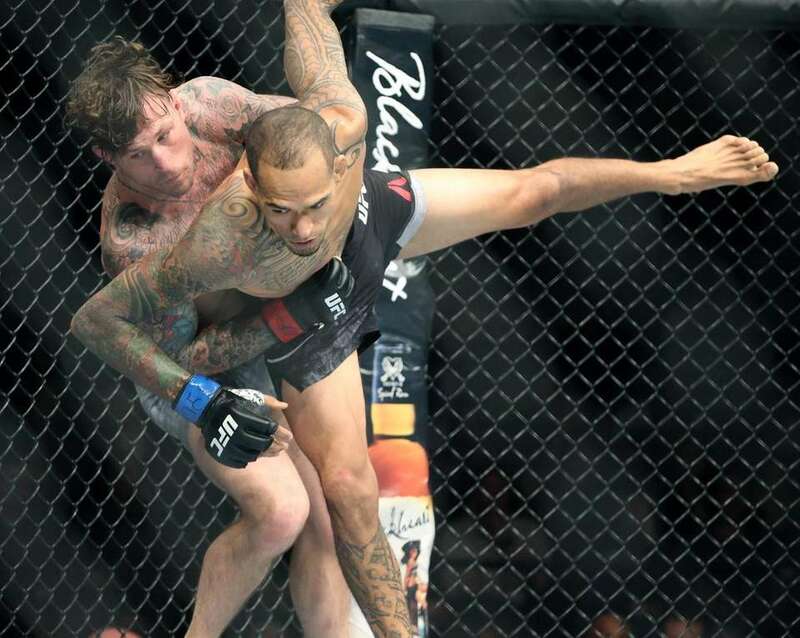 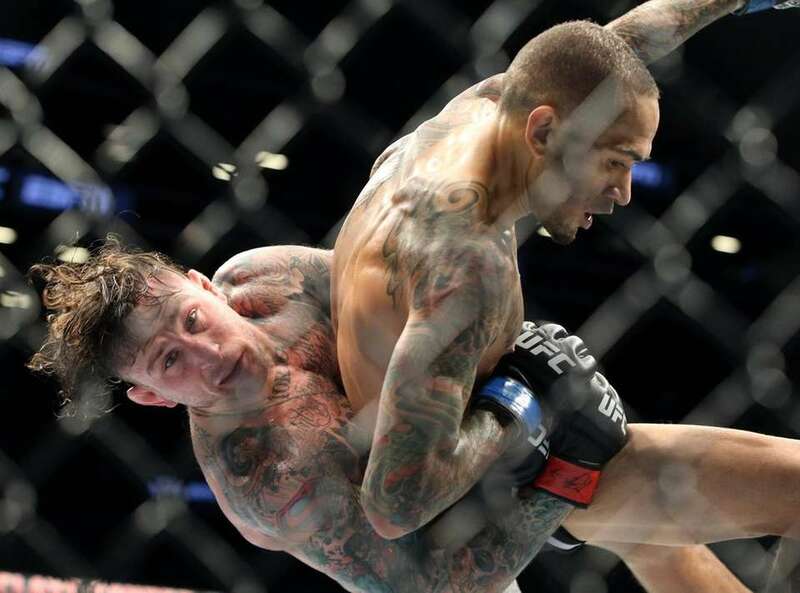 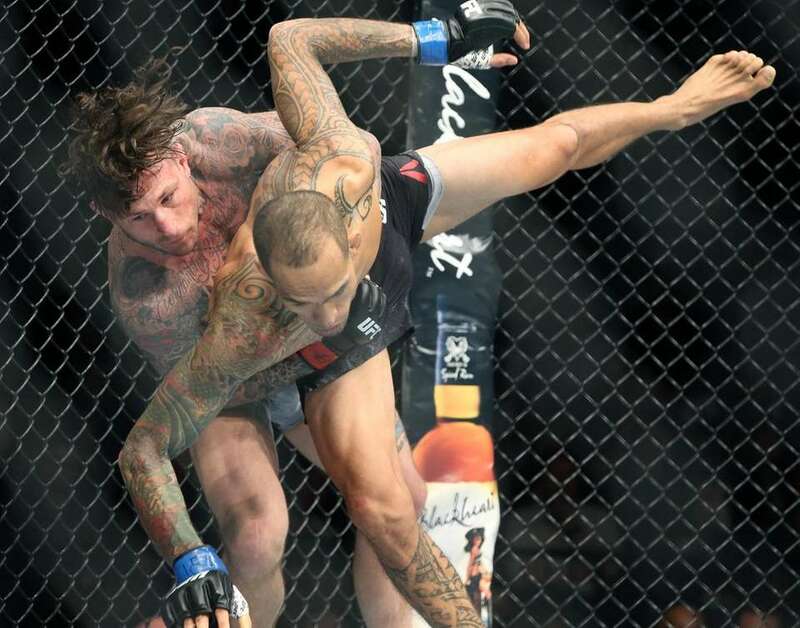 Gregor Gillespie, top, punches Yancy Medeiros during the second round of a lightweight mixed martial arts bout at UFC Fight Night on Saturday, Jan. 19, 2019, at Barclays Center. 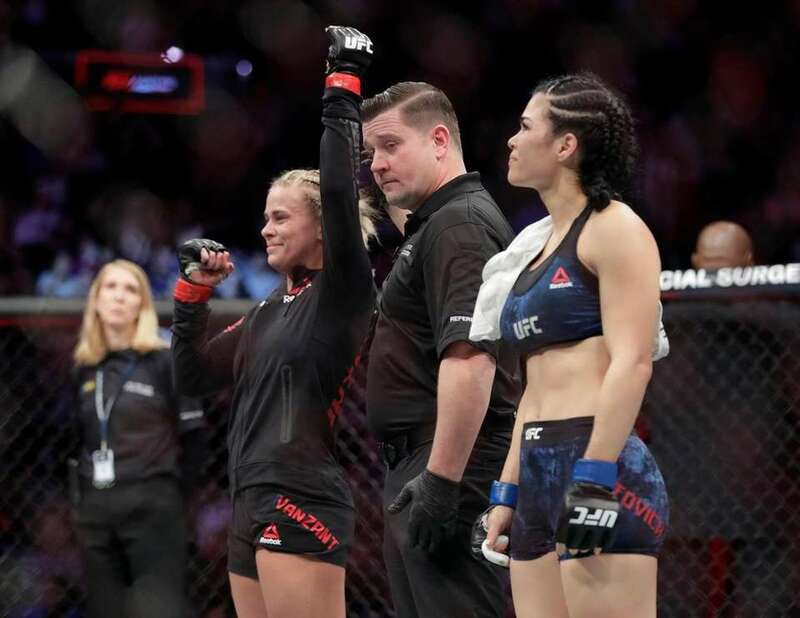 Paige Vanzant, left, celebrates after beating Rachael Ostovich in a women's flyweight mixed martial arts bout at UFC Fight Night on Saturday, Jan. 19, 2019, at Barclays Center. 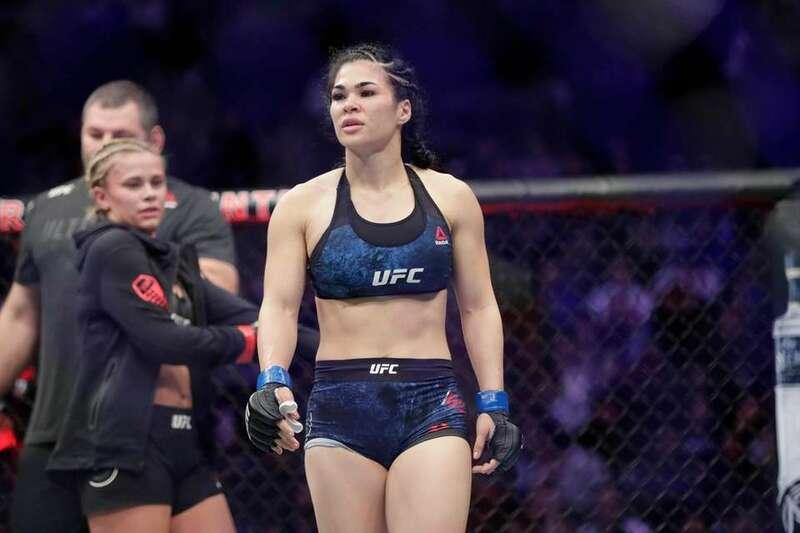 Rachael Ostovich, right, reacts after losing a women's flyweight mixed martial arts bout against Paige Vanzant, left, at UFC Fight Night on Saturday, Jan. 19, 2019, at Barclays Center. 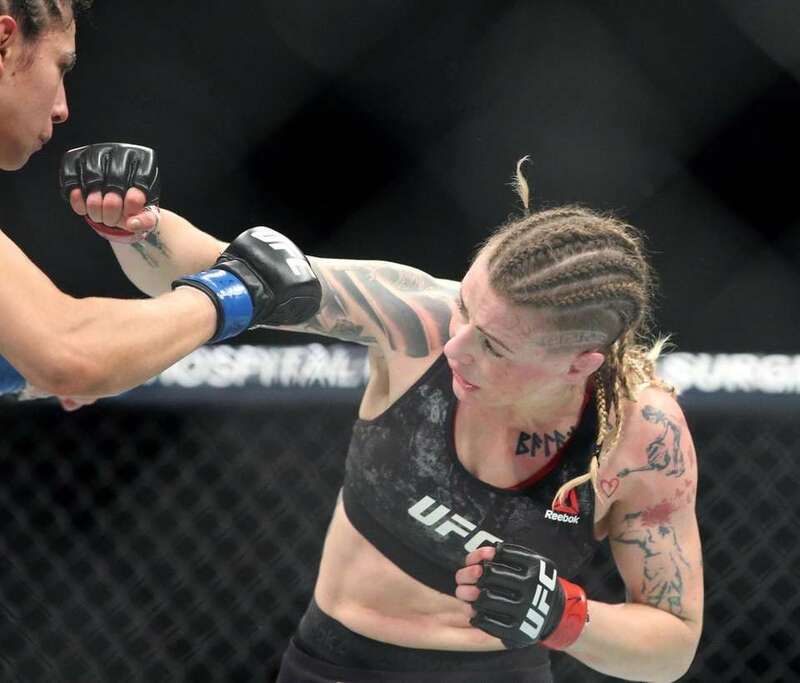 Paige Vanzant, right, wrestles with Rachael Ostovich during the second round of a women's flyweight mixed martial arts bout at UFC Fight Night on Saturday, Jan. 19, 2019, at Barclays Center. 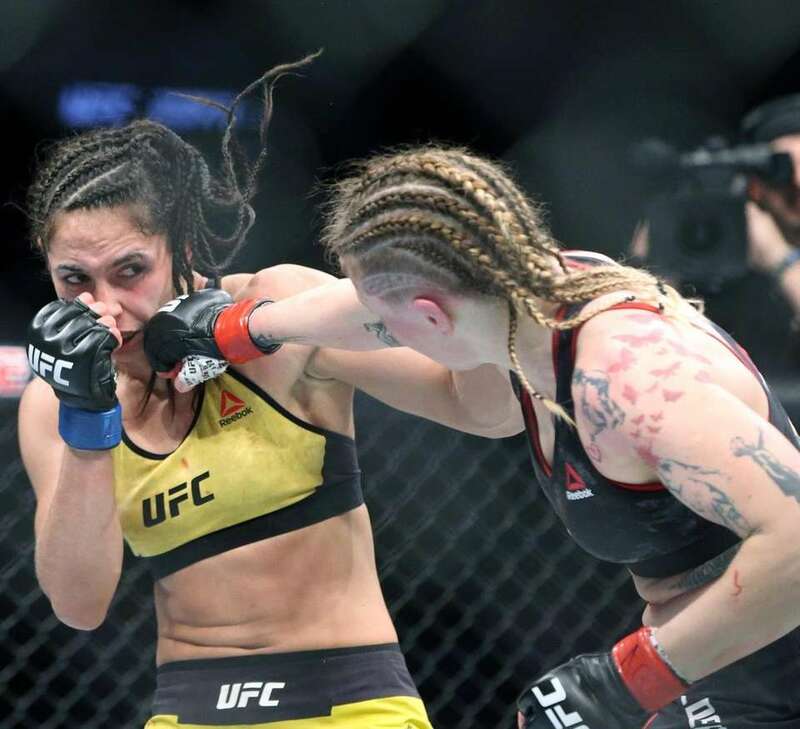 Rachael Ostovich, right, punches Paige VanZant during the first round of a women's flyweight mixed martial arts bout at UFC Fight Night on Saturday, Jan. 19, 2019, at Barclays Center. 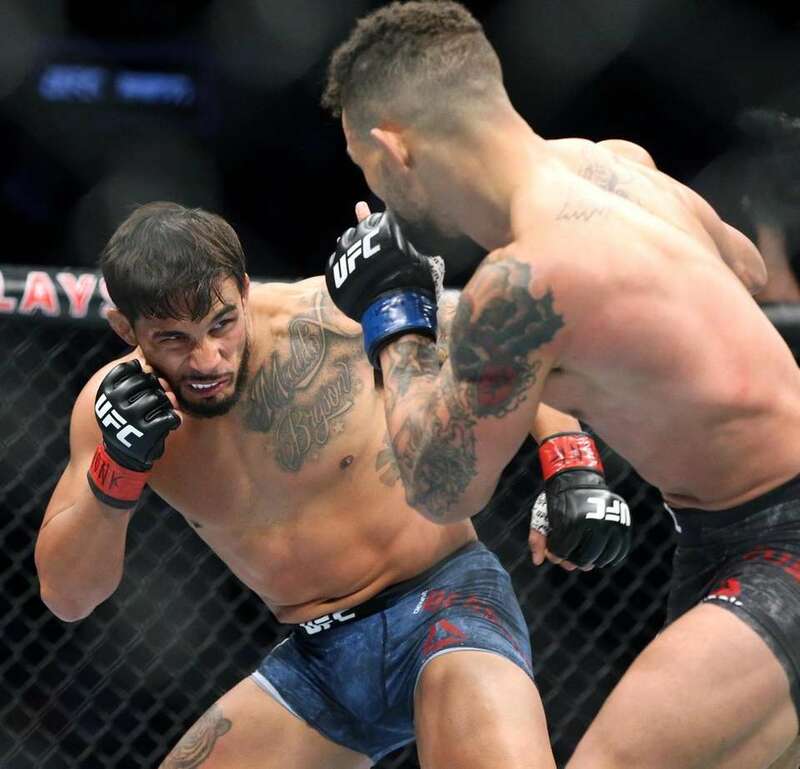 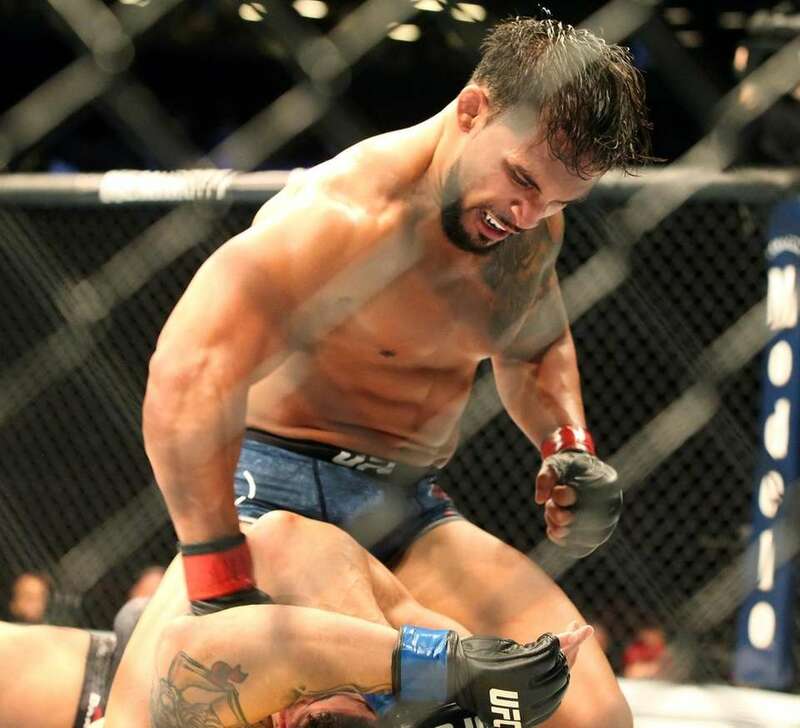 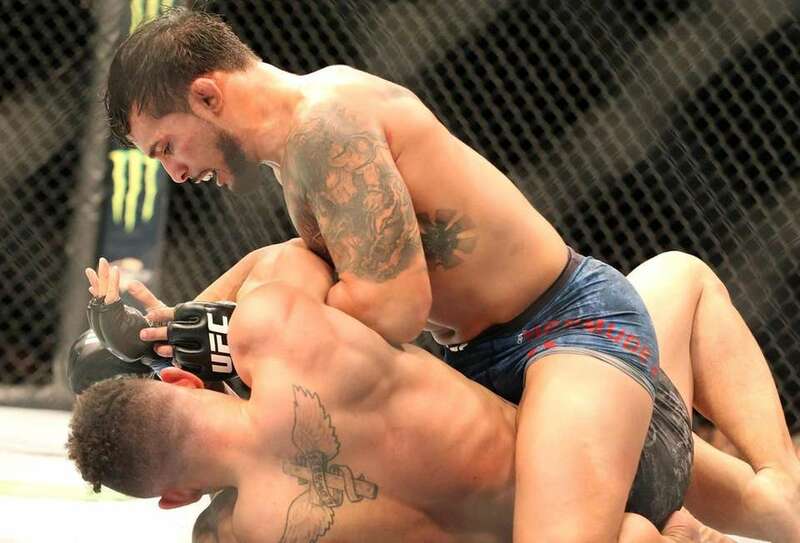 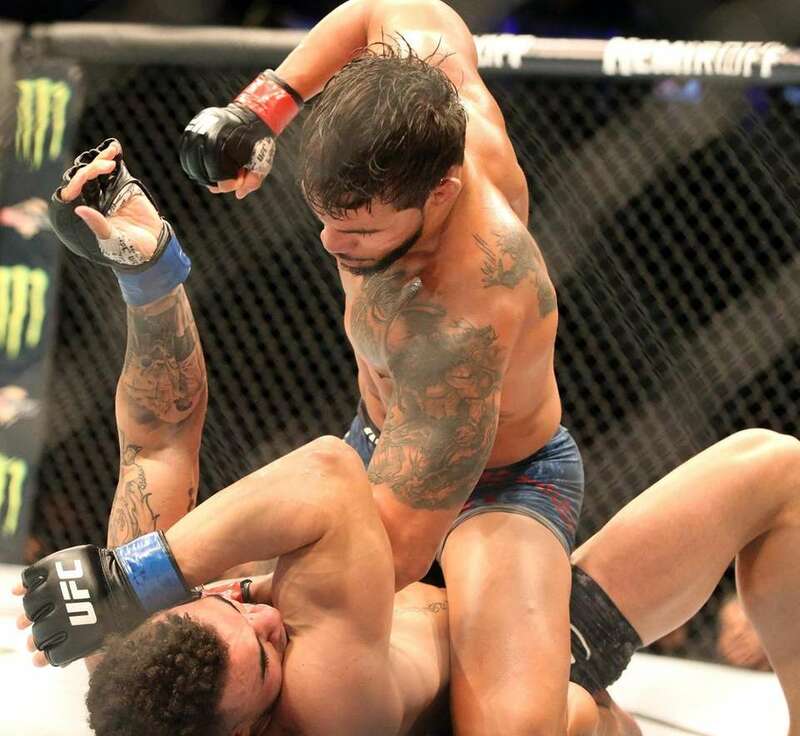 Dennis Bermudez fights Te Edwards during UFC Brooklyn at Barclays Center on Saturday, Jan. 19, 2019..
Dennis Bermudez fights Te Edwards during UFC Brooklyn at Barclays Center on Saturday, Jan. 19, 2019. 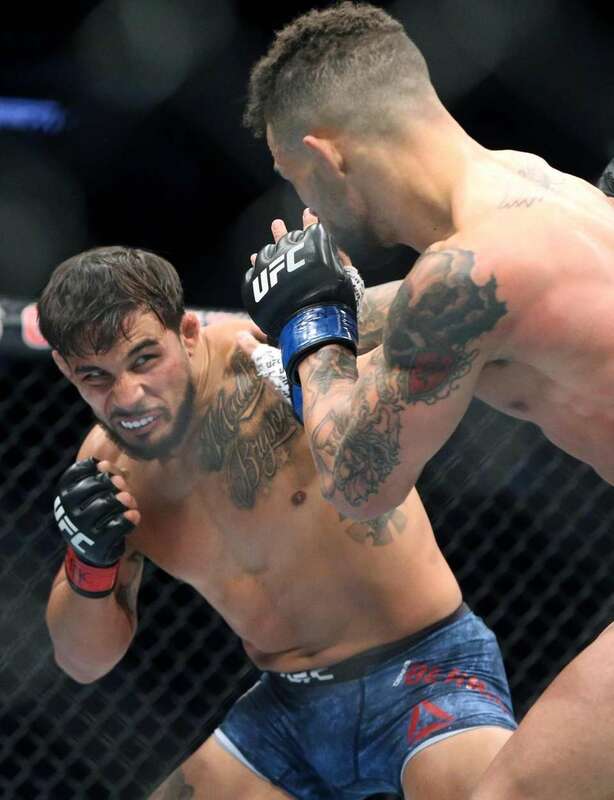 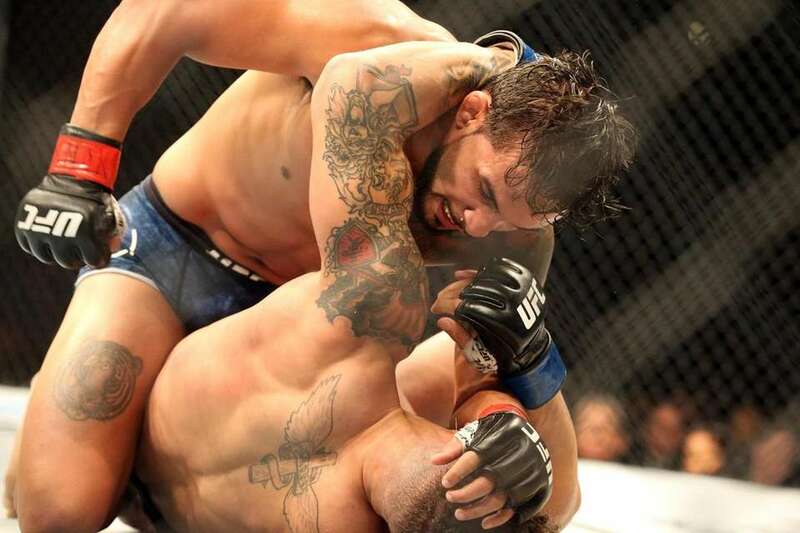 Dennis Bermudez, left, fights Te Edwards during UFC Brooklyn at Barclays Center on Saturday, Jan. 19, 2019. 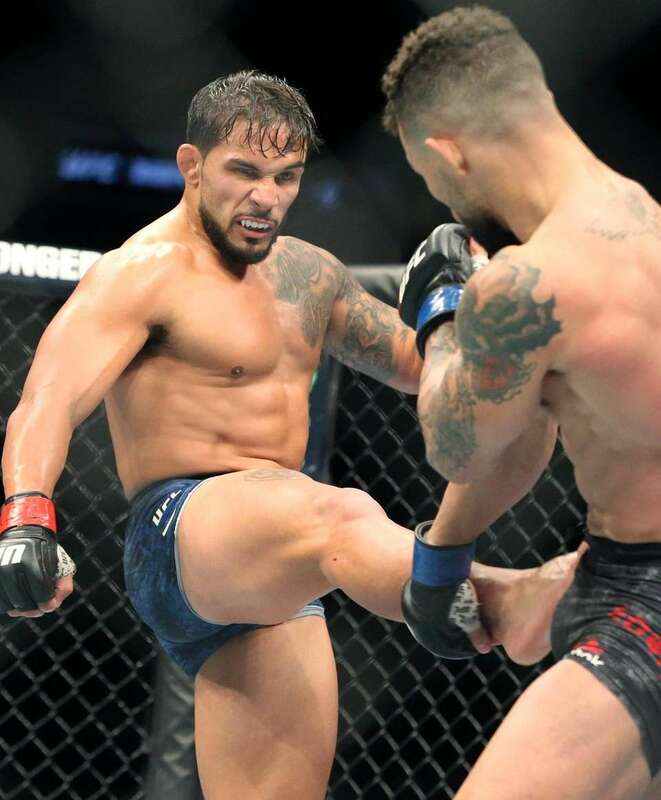 Dennis Bermudez, top, fights Te Edwards during UFC Brooklyn at Barclays Center on Saturday, Jan. 19, 2019. 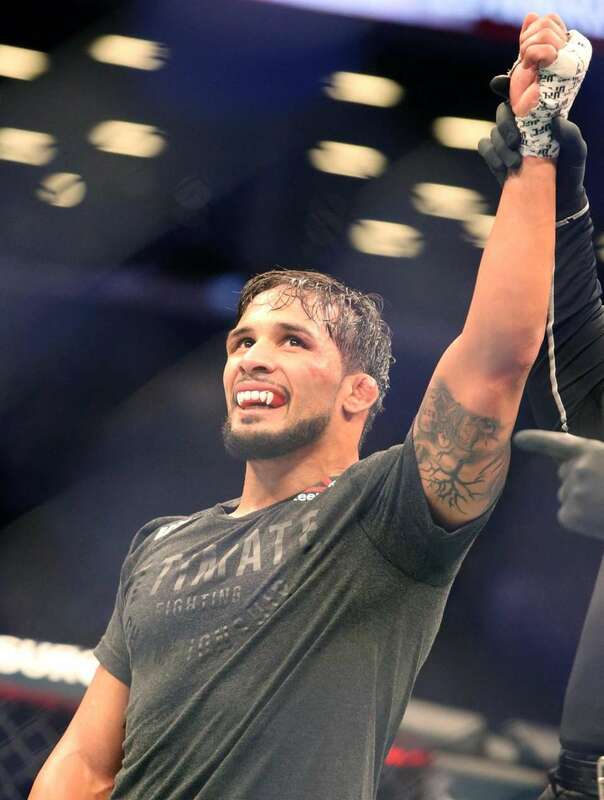 Dennis Bermudez celebrates after defeating Te Edwards during UFC Brooklyn at Barclays Center on Saturday, Jan. 19, 2019. 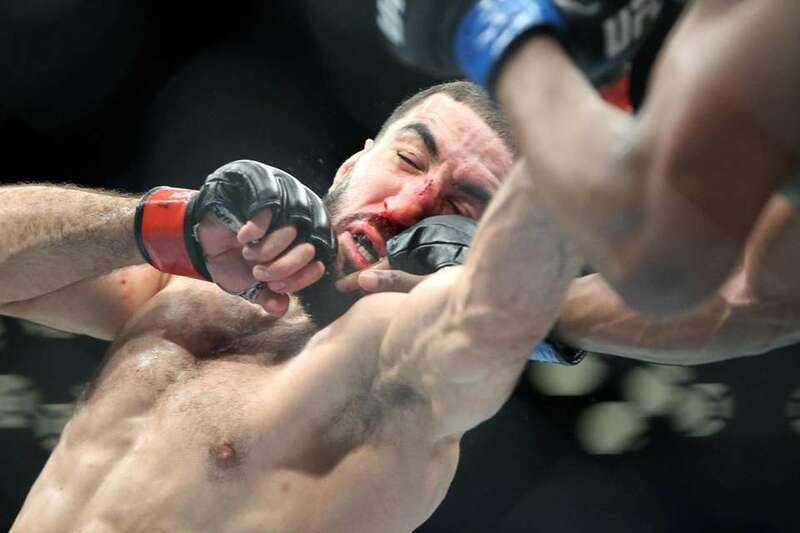 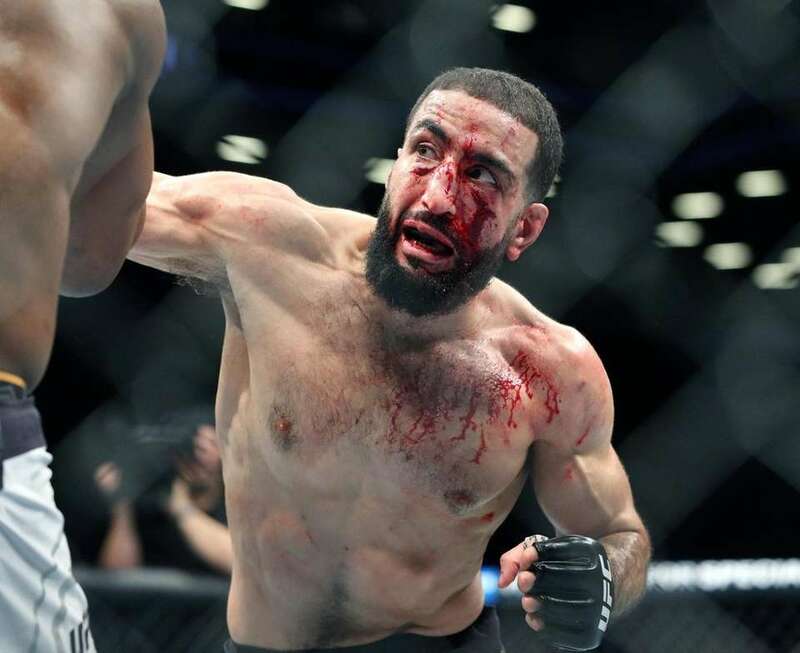 Belal Muhammad is hit with a left against Geoff Neal during UFC Brooklyn at Barclays Center on Saturday, Jan. 19, 2019. 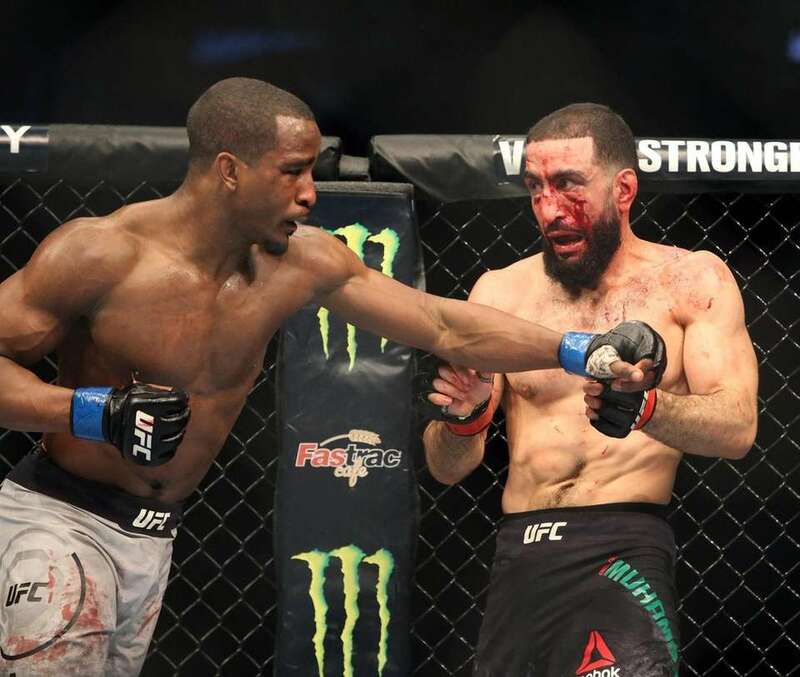 Geoff Neal, right, fights Belal Muhammad during UFC Brooklyn at Barclays Center on Saturday, Jan. 19, 2019. 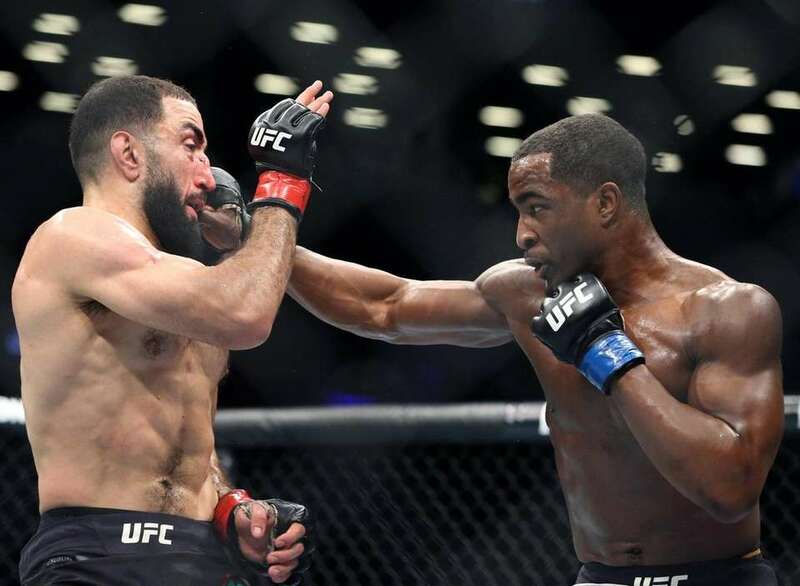 Geoff Neal, left, fights Belal Muhammad during UFC Brooklyn at Barclays Center on Saturday, Jan. 19, 2019. 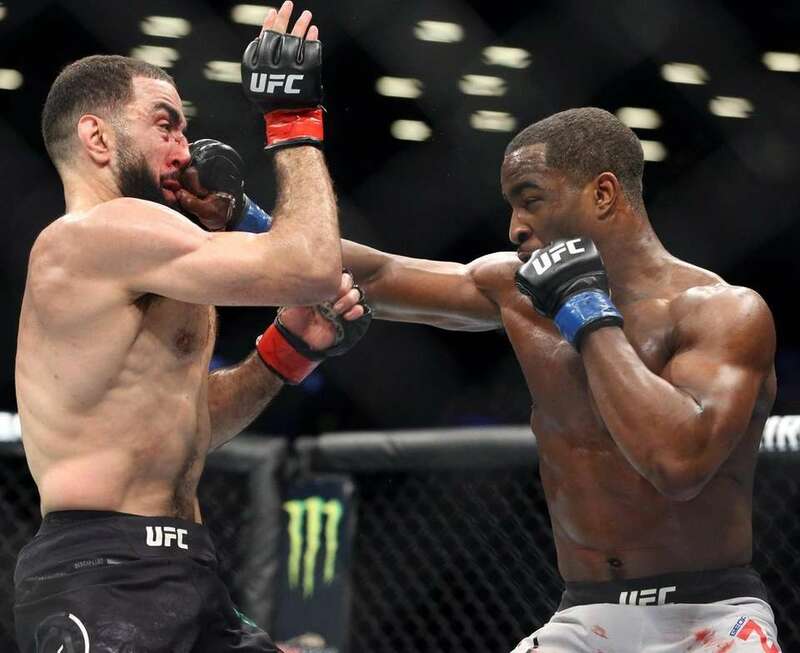 Belal Muhammad tries to connect with a left against Geoff Neal during UFC Brooklyn at Barclays Center on Saturday, Jan. 19, 2019. 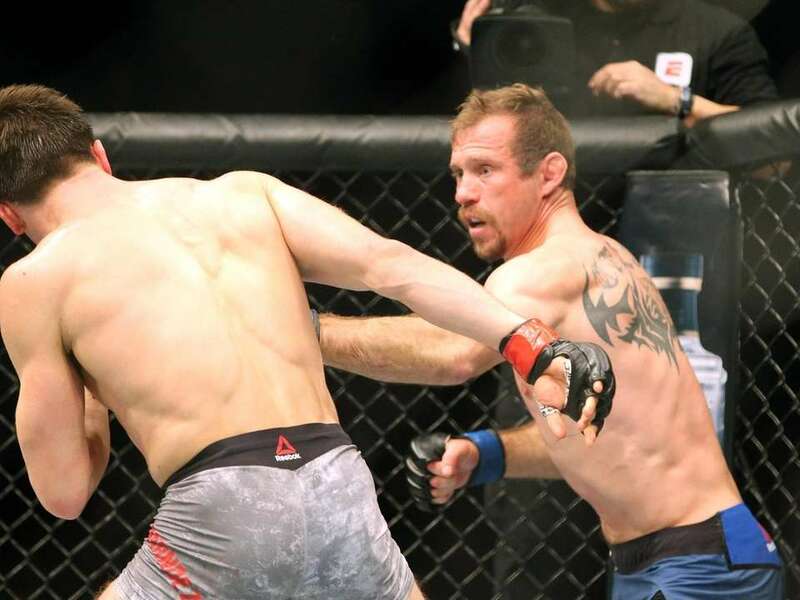 Donald Cerrone, right, fights Alexander Hernandez during UFC Brooklyn at Barclays Center on Saturday, Jan. 19, 2019. 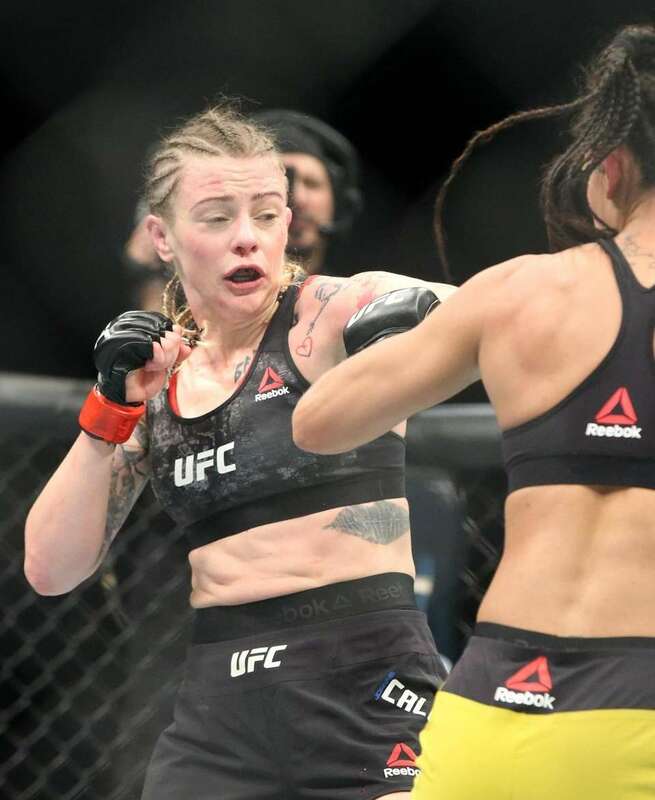 Joanne Calderwood, left, fights Ariane Lipski during UFC Brooklyn at Barclays Center on Saturday, Jan. 19, 2019. 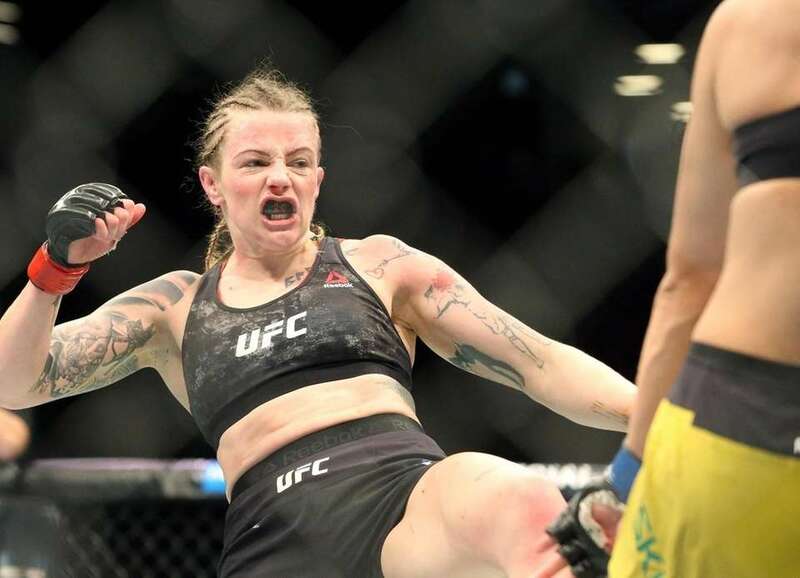 Joanne Calderwood fights Ariane Lipski during UFC Brooklyn at Barclays Center on Saturday, Jan. 19, 2019. 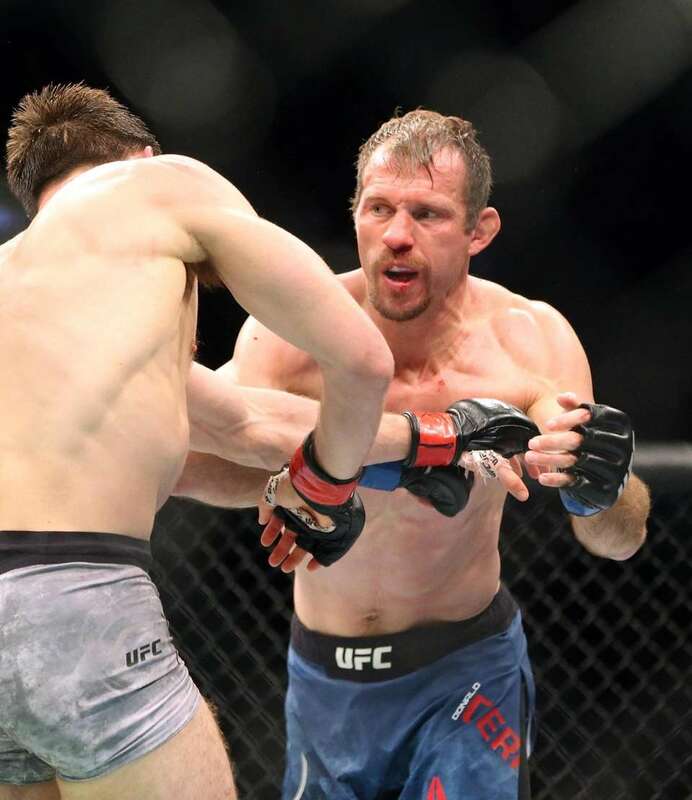 Donald Cerrone, left, fights Alexander Hernandez during UFC Brooklyn at Barclays Center on Saturday, Jan. 19, 2019. 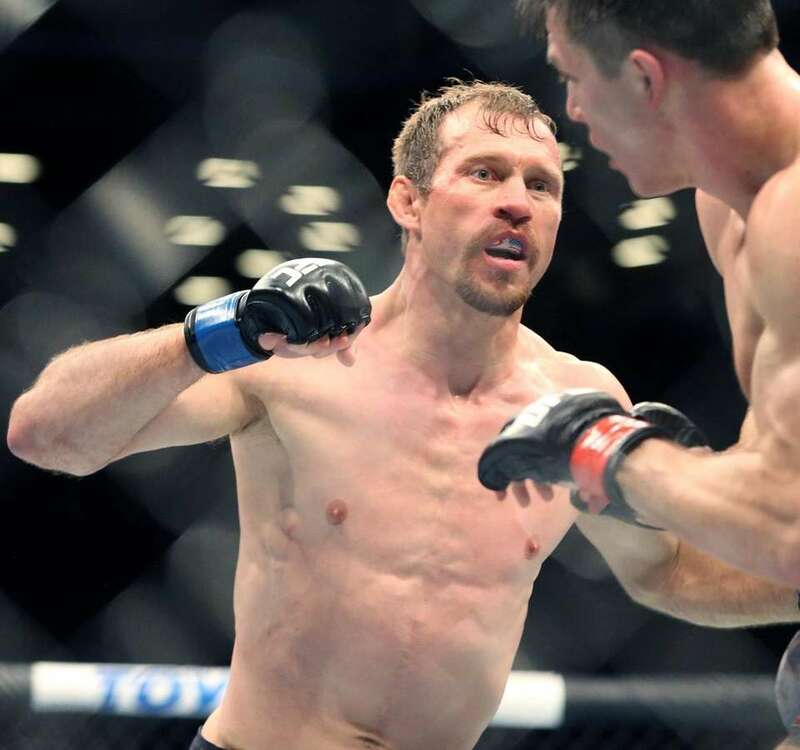 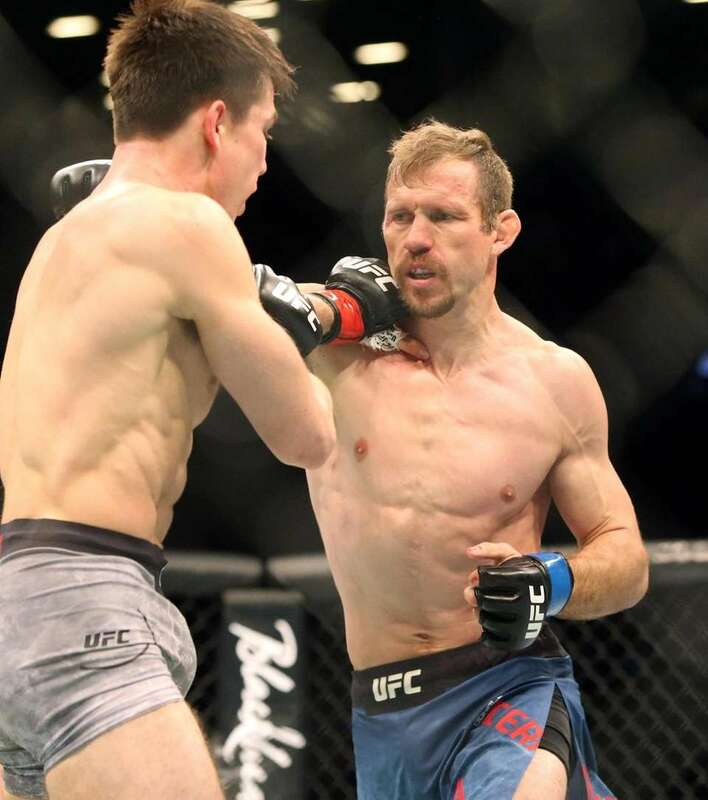 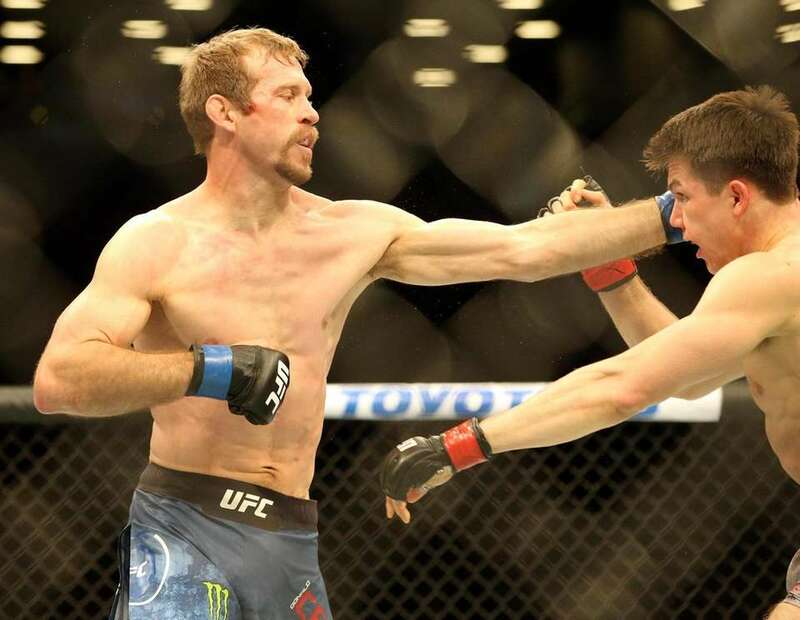 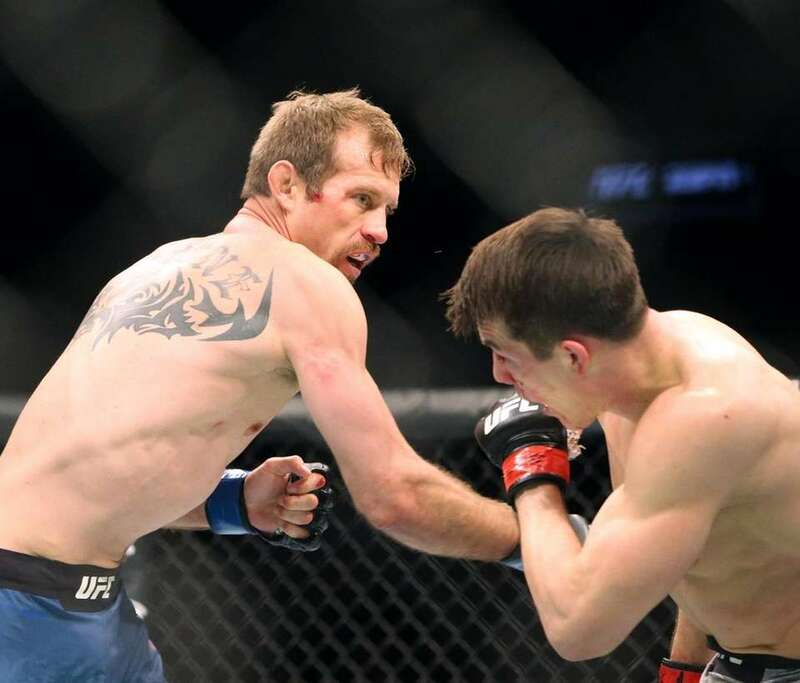 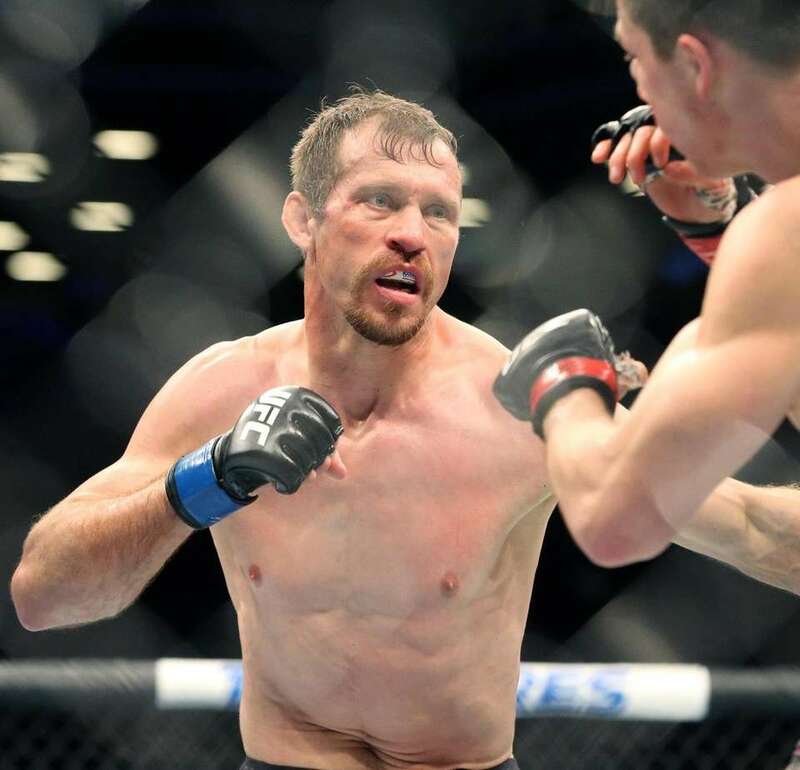 Donald Cerrone fights Alexander Hernandez during UFC Brooklyn at Barclays Center on Saturday, Jan. 19, 2019.